The Novation MiniNova is a brand new compact, 37 Mini-Key synthesizer, built using the same engine as it’s flagship “Ultranova” model. 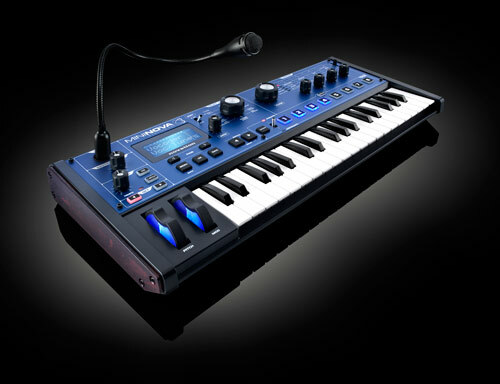 Since the introduction of the Supernova synth, the first of the Nova range in 1998, Novation has always innovated with each model. The MiniNova has many brand new features inclusing “Animate” controls and “VocalTune” voice effect. The 8 back-lit “Animate” buttons trigger synth engine “mods” to twist and warp the sounds as you play. Novation have also included a large filter cutoff knob and an arpeggiator, where you can use the 8 buttons to create brand new realtime sequences. VocalTune does exactly what you are expecting it to, replicating the psudo vocoder Auto-Tun e vocals that have (somewhat annoyingly, at least to a professional producer!) dominated urban music for the past decade. It does amaze me that it’s taken this long for someone to add this to a hardware synth, respect to Novation for giving the people what they want! The mic input is mounted on the top of the synth, so you are free to use your own choice of microphone. There is also an instrument input, so you can also put your guitar through the effects engine. The synth engine has an impressively powerful synth, with 14 standard waveforms, such as Sine, Square, Pulse & Triangle, 20 Digital waveforms and 36 Wavetables. There are 3 oscillators per voice which can either be individually tuned or synced and a “Hardness” setting which can act as an extra low pass filter. Talking of filters, there are 14 different types, out of which 2 can be run at the same time. There are also 3 LFO’s, 6 Envelope Generators and 20 modulation slots where you can link modules inside the synth engine to create your custom shaped sound. Up to 5 effects can be put on each voice including reverb, delays, choruses and their own Gator effect. The bundled editing software actually runs as a plugin inside your DAW program, but as with any decent analogue synth, every parameter is actually editable from the synth itself. The Scan team are due to visit the Novation factory next week and will report on thier return once they’ve got thier eager, (not quite so) little hands on this little monster!